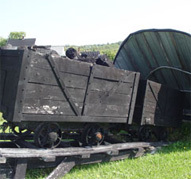 Tour a Mine, Springhill Miners’ Museum is located in Springhill (off Route 2) in the Fundy Shore and Annapolis Valley region. Tour the depths of a Springhill coal mine, famous in song and legend, with one of our knowledgeable guides. Hear stories of the disaster of 1891, the 1916 subterranean fire which raged through the galleries, the loss of 39 men in the 1956 explosion and the major “bump” in 1958 which killed 75 men. The Miners’ Museum displays unique artifacts of the history of the town and its remarkable industrial heritage. Other features include a gift shop, picnic area, and parking with trailer access to free water hookups. Bus tours are welcome. The Springhill Miner’s Museum is wheelchair accessible. Visa and MasterCard are accepted.